Last week, Northern Arizona University President Rita Cheng announced that the university would eliminate 60 positions and that all academic departments would have to cut their spending by 4.5 percent. “There is no way around it,” The Daily Sun quoted her saying. Arizona State University: A new, one-time fee raises the cost of attending to $10,478 for Arizona residents, about 3 percent higher than last year. Northern Arizona University: New Arizona resident undergraduates will pay $10,358, about 4 percent higher than last year. 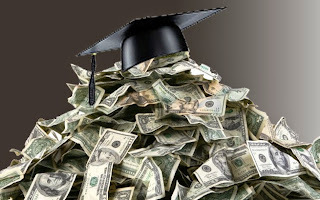 University of Arizona: New Arizona resident undergraduates will pay $11,403, about 4 percent more than last year. You can also see the Arizona Republic’s reporting on the tuition increases here. Between 2008 and 2014, state spending per student in higher education dropped more than 48 percent, the highest decrease in the U.S. And the tuition increases at Arizona universities have been even more astonishing: the cost of attendance has increased by almost $4500 dollars, or more than 80 percent. This session alone, the Republican Legislature cut another 13 percent—$99 million—from state university budgets. But what does all this mean for students in Arizona’s universities? Average student debt has risen by almost 20 percent since 2008, when the Arizona Legislature began cutting university budgets, and recent estimates suggest Arizonans with student loan debt owe an average of more than $25,000. The costs of higher education have fallen more and more heavily on Arizona’s students, and this has harmful consequences for the students’ and the state’s economic future. The trends in state funding, tuition rates and student debt demonstrate that higher education opportunities are not a priority for Arizona’s Republican leaders. This disinvestment is bad news for the entire state: according to a recent study, 68 percent of all jobs in Arizona will require post-secondary education by 2020. Yet only about 54 percent of high school graduates go directly to college and even fewer, less than 25 percent, earn degrees within six years of finishing high school. Moreover, research has repeatedly demonstrated that the consequences of student loan debt include lower household net worth and reduced rates of home ownership. Republican leaders attempted to justify the most recent round of education budget cuts by claiming they had no other options. That is simply not true and Arizona deserves better. If you would like to get involved in protecting Arizona’s economic future, click here to find ways to ensure your voice is heard.